Sony has talked down rumours that the white PlayStation 3 is on its way to North America and/or Europe, despite the company filing suggestive documents with the US Federal Communications Commission (FCC). The documents were filed with the FCC by Sony Computer Entertainment America (SCEA) back in October. However, Sony requested that the documents have a short-term confidentiality in order to “avoid premature release of sensitive information prior to marketing or release of the product to the public”. While that may sound conclusive that a white PS3 is coming to North America at least, Sony claims it isn’t. Sony Computer Entertainment Europe (SCEE) has since told website Next Generation that although it’s aware of the filing, SCEA’s plans to release a white PS3 may not yet be concrete. SCEE added that there are currently no plans to release a white PS3 in Europe. It also said that Sony makes many similar FCC filings each year, but that it’s continually evaluating market trends and consumer input to determine the appropriate PS3 models. So there. Japanese gamers will be indifferent to the news though, because the region’s had access to a white PS3 since November. 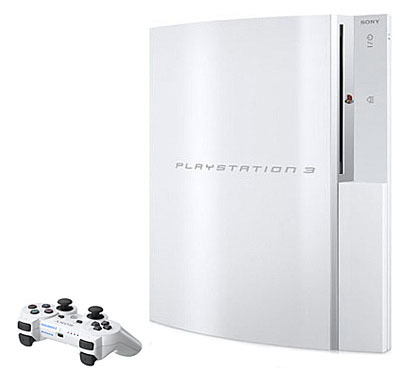 So, if you’ve already decided that you really need a white PS3 to accompany your arty, minimalist living room, then you’ll have to try and bag yourself a white PS2 for the time being.